SkySafari's developers are a talented, quirky, and fun-loving group of people with diverse talents and interests. Here's a little more about the folks who've made our products great. Tim DeBenedictis (Founder/Owner) has been writing astronomy software since his high school days. After graduating from MIT in 1993 with a degree in Earth, Atmospheric, and Planetary science, Tim found himself in Silicon Valley when the internet boom began. He held engineering positions at several financial services and technology companies throught the dot-com boom, and returned to his "astronomical roots" after the bust. As product architect at Carina Software from 2004 - 2010, Tim oversaw the development of the Voyager astronomy software through multiple OS releases and revisions. 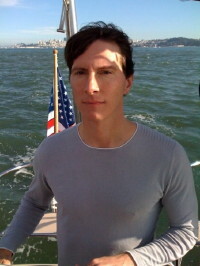 Tim was also one of the two principal designers behind the award-winning SkyVoyager iPhone app. 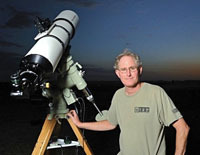 Bill Tschumy (Software Designer/Astronomy Educator) is a talented software architect and a passionate amateur astronomer. Bill worked closely with Steve Jobs at NeXT, where his passion for elegance and simplicity in user interface design was engrained. Bill's also been doing astronomy for more than 25 years. Bill contacted us during the bottom of the "great recession" of 2009 after the startup he'd been working for had folded. From that initial contact came the award-winning SkyVoyager iPhone app - and a full-time position at Southern Stars. Bill currently resides near Boulder, Colorado, where he is able to enjoy the great outdoors - both daytime and night. We would be remiss not to credit many other folks who've helped develop both our products and our business. In particular, these include the humorous and helpful programming advice of Andrew MacBride and David Rowland; the business inspiration and marketing savvy of Joe Longo; and the legal support from the folks at Hanson Bridgett. And a special thanks to Aaron Hurst for developing the hardware and firmware for the SkyFi wireless telescope controller on his spare time, Chris Fettin for providing graphic design services for Southern Stars since its inception in 2009, and Chris Phoenix for working to improve the SkyFi telescope controller.